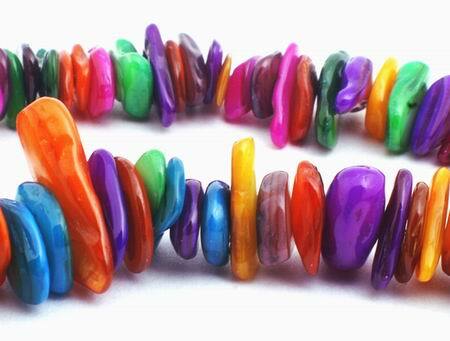 Price is per 32-inch strand of these beautiful beads. Largest measures about 15mm x 7mm x 4mm, all drilled ready to thread. The shining, playful, and reflected light of mother of pearl has attracted the attention of human beings since the beginning of the world. Societies, tribes, and nations have all added the technology of their day to their experience, knowledge, and understanding, and they have turned mother of pearl from one form into another. Though mother of pearl is quite widespread around the world, its assumption of the aspect of a magnificent branch of the arts after a past of many centuries began when it came into the hands of the Ottoman Turks. (nâ´ker) or nacre , the iridescent substance that forms the lining of the shells of fresh-water and some salt-water mollusks. Like the pearl it is a secretion of the mantle, composed of alternate layers of calcium carbonate and conchiolin. Among the chief sources are the pearl oyster, found in warm and tropical seas.